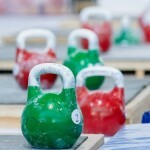 Competition kettlebells. Russian professional standard. Please attention! We can send you kettlebells by parcel with only ONE kettlebell. Please make different orders for a few kettlebells.